From the moment you step on our lot until the time you drive away in your next car, your buying experience with Country Chevrolet is our number one priority. We encourage you to use the expertise and resources of our sales staff; they are here to help you find the right car at the right price. Call us today at 800-947-1250 to schedule your test drive! Pat has been with Country Chevrolet since 1992! He enjoys searching the Internet to find the best, quality, pre-owned vehicles for our customers. Pat also likes fishing and boating. Heidi Erickson joined Country Chevrolet in June 2003. Heidi is responsible for daily accounting and payroll functions, budgeting and financial statement preparation. Heidi brings over 25 years of accounting experience to Country Chevrolet. She loves her job because of the people she works with and the family-environment. When not in the office she enjoys a day on the slopes in the wintertime, a long weekend of camping in the summer and hanging out with her family. Kristen has been the Finance Manager at Country Chev for over 15 years. She handles all customer financing, extended service contracts, dealer trades and trade appraisals to makes sure that our customers get the best deal! She’s a busy lady here at Country Chevrolet! Kristen enjoys running, biking and spending time with her 9 year old daughter. Matt started working as a Sales Professional for Country Chevrolet back in 2003. Now over a decade later Matt loves more than ever to help customers find that right vehicle. In some cases, Matt has sold a vehicle to 3 generations of customers in the same family. The Warm and Fuzzy feeling you get when you purchase a vehicle from Matt and Country Chevrolet is what sets us apart for the rest! Ryan has 10+ years of sales experience with selling Chevrolet vehicles. He enjoys playing and watching sports. In fact, his favorite summer activity is watching baseball games at Target Field! Debra has been with Country Chevrolet since 2006. She has 10+ years of auto sales experience and is here to help you with your vehicle needs! Debra is a horse fanatic and loves to talk about "real horsepower!" She spends her spare time taking care of her own horses. Jeff has been working at Country Chevrolet since 2011 and has been working in the Automotive Industry for 25+ years. Jeff enjoys helping customers with all of their parts needs. He also enjoys spending time with his three children, camping and fishing. Dale is available at our Parts Counter to help you with any parts or accessories that you may need. He enjoys going to church and studying God's word, the Bible. "I love my Lord and Master Jesus Christ." Laura has been working in the automotive industry since she graduated St. Cloud Technical College in 2010 with her AAS Degree as an Automotive Technician. She enjoys helping customers better understand how their vehicles work and what they need when they aren’t working. She enjoys spending time with her 3 daughters, playing in the mud, camping, and reading. Ashlie Kurr - Service Admin. Michael has been with Country Chevrolet for the past 17 years and is our Chevrolet Hybrid and Volt Specialist. He has five children and has been married for 30 years. If Michael had more spare time, he would spend it hunting and fishing. Jason enjoys working on cars. He is ASE certified in brakes, suspension and steering. "Everyday at Country Chevrolet is different and exciting!" Drew enjoys hunting, fishing and playing football. He's on his first year playing semi-pro for the St. Cloud Renegades. He is also restoring a '67 Charger, '55 Lincoln Coupe & a 40's Ford cab over in his spare time. Sheila (Mengelkoch) Kappes started as the night receptionist in September 2004, while in high school. She continued working as the receptionist throughout college and took over the bookkeeper position at the dealership. She is in charge of daily deposits, accounts payable, accounts receivable, assisting in payroll, and submitting warranty claims. When not at work she loves to be outdoors on the Harley, boat, or in the fish house! Judy started working as a part-time receptionist at Country Chevrolet in 2003 while raising her three beautiful daughters. In 2008 Judy went to a full time position as an Administrative Assistant & Title Clerk. Her outside interests are gardening, arts & crafts, home decorating and watching HS Girls Volleyball. Allyson is a Junior at the Annandale High School. She enjoys hanging out with her friends and family and playing tennis on her high school team. She plans to be a sonographer in the future. Grant is attending school at the University of MN Duluth for a degree in communication. When he is not at school, he enjoys hanging out at Country Chev! After working for over 40 years as a production manager at a manufacturing company in St. Paul, I retired in 2002. My wife and I moved to the Annandale area in 2007 when we purchased a lake home. Country Chevrolet has sold me a number of trucks over the years, before and after our move here. I appreciated the value they offered, service, and quick response. With some time on my hands (I'm not good at doing "nothing"), I was hired as a driver, which is what I have been doing since 2007. I really enjoy driving, meeting the customers, and working with the great group of people at Country Chevrolet. Jim started working at Country Chevrolet when he was 18 years old and retired 43 years later! He's been our detailer, service technician, and Parts Manager throughout the years. Jim still stops into Country Chevrolet weekly to work as one of our drivers. Lee retired as a system engineer from AT&T with 40 years of service. He has been driving for Country Chev for the last 12 years. He enjoys meeting new people and being part of the Country Chev team! "Uncle Ralph" retired after 40 years of service as an Electrical Contractor. He has been driving for Country Chevrolet for the past six years. Harold is happily enjoying his retirement. He fills his days with woodworking, artistic painting, traveling and driving for Country Chev. Randy has been driving for Country Chevrolet for the past eight years after retiring from the Post Office with 30 years of service. While working at the Post Office, Randy purchased several vehicles from Country Chevrolet and was impressed with our commitment to our customers and thought Country Chevrolet would be a good place to work! Randy enjoys riding his motorcycle, snowmobile and 4-wheeler. 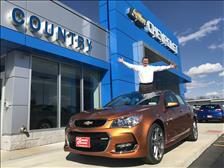 Craig is a retired Bar & Restaurant owner and recently started driving for Country Chevrolet. He also mows lawn at Camp Friendship. Craig is an avid deer and pheasant hunter and loves going to his second home in AZ. Tom recently retired after working in maintenance for 29 years with the City of Howard Lake. He is enjoying his retirement by traveling, riding his motorcycle, spending time with his grandchildren and driving for Country Chev! Esther was born and raised in Iowa and is a graduate of the University of Iowa. She has been happily married to Mike for 33 years and has four lovely grandchildren. Myron has been driving for Country Chevrolet for the past few years. Myron retired as the Annandale Chief of Police after 10 years of service and 12 years of service as a Wright County Deputy. He's even a graduate of Annandale High School, GO CARDINALS!